While interaction with online educational games and apps can be a learning experience for our kids, the percentage of young children who are trading in picture books for LED screens has crept up to astonishing levels. A recent report by Common Sense Media found that over one-third (38 percent) of 0- to 8-year-olds studied had used a smart phone, mp3 player, video iPod, iPad or a similar tablet—and 11 percent of children used these technological trinkets on a daily basis. So how do we make sure our little ones will grow up to be well-rounded adults, and not over-stimulated zombies? Here are some things you can do to make sure your child gets the down time she needs in today's wired world. Make crafts a part of every week. Crafts may seem like fluffy stuff, but cutting paper, crumpling tissue paper, and drawing all build the hand muscles kids will need for writing. While it may not be possible to squeeze a craft project into each an every day, commit to doing crafts at least 3 times a week with your child. Limit screen time. 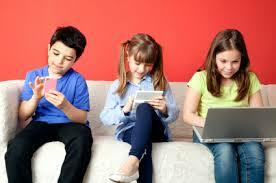 Setting family boundaries for TV, movies, computers, smart phones and tablets frees up precious time for family bonding. Detaching yourself from your iPhone may be difficult, but it will show your kids that mom and dad benefit from a tech break too—and are willing to practice what they preach. Grab a story and snuggle. Reading, either aloud to your child or along with her, opens her eyes to people, places, animals and ideas beyond the world of Spongebob Squarepants. Even if your preschooler isn't able to sound out words yet, hearing you read a variety of genres can broaden her vocabulary and foster a lifelong love of books. Take a time-out in nature. Unstructured play time is being threatened at school with the elimination of recess, which makes getting your kids off the couch and into the backyard more important than ever. Being outside allows children to relax, work out daily stresses and get in touch with their other senses—touch, smell and taste—that are slighted by TV and computers. Invest in open-ended toys. Television, DVDs and video games rob children of uninhibited pretend play by laying out a fast-paced adventure for them to follow. Rekindle their imagination with simple blocks, stuffed animals, colorful scarves, and unbranded dolls they can use to dream up their own world. Plan a tech-free family day. Schedule a day at the park, beach, aquarium or botanical gardens for the family, and leave the gadgets at home. Without the distractions of a smart phone, you will be able to give your children—and the experience—the undivided attention they deserve. Cook a meal with your tiny sous chef. Cooking skills may seem out-of-reach for your youngster, but participation in the kitchen is beneficial in a number of ways, even for toddlers. Stirring, measuring ingredients, and cracking eggs are safe ways to introduce the concepts of healthy eating habits, teamwork and basic math. Plus, picky eaters are much more likely to try dishes they've had a hand in creating! It's impossible to shield your young child from technology on a day-to-day basis, but it's important to make an effort to show her life outside of life's small screens. Encouraging time away from the virtual world helps to keep your child relaxed, curious and focused on the things that really matter.